The United States Congress designated the Chamisso Wilderness (map) in 1975 and it now has a total of 455 acres. All of this wilderness is located in Alaska and is managed by the Fish and Wildlife Service. 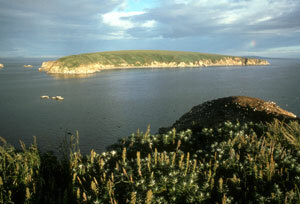 Chamisso Wilderness is comprised of Chamisso and Puffin Island and is a subunit of the Chukchi Sea Unit, the northernmost the Alaska Maritime National Wildlife Refuge units. Chamisso Wilderness has one large sand spit and a low beach zone surrounding a covering of tundra with a few marshy bogs. Although Chamisso Island is much larger (rising over 200 feet out of the sea), Puffin Island houses many more nesting birds, especially horned puffins, black-legged kittiwakes, and thick-billed murres who build their nests on the steep-walled cliffs that fall into Spafarief Bay. An unusual sight is horned puffins digging burrows in which to lay their eggs, much like tufted puffins do. Eskimos still cross from the mainland to gather eggs, primarily from kittiwakes and murres. No other animals live on the islands except for birds and the occasional fox that wanders over on the frozen sea in winter. Walruses, seals, and whales often may be seen in Spafarief Bay. Boating is dangerous due to frequent storms that blow in during cool summers and frigid winters. Summer temperatures average in the low 50s and 60s (Fahrenheit) and in the low 20s and 30s in winter. Daylight never leaves in mid-June and appears briefly as twilight in mid-December. Chamisso Wilderness receives 73.5 inches of precipitation each year. Planning to Visit the Chamisso Wilderness? How to follow the seven standard Leave No Trace principles differs in different parts of the country (desert vs. Rocky Mountains). Click on any of the principles listed below to learn more about how they apply in the Chamisso Wilderness.